Twenty-three acres of land on the southeastern corner of 95th Street and Cottage Grove Avenue, the future site of Imani Village, will soon host this first component—a 22,000-square-foot health facility run by Advocate Health Care. The brainchild of the leadership of Trinity United Church of Christ, a church in Washington Heights, Imani Village will be a multifaceted community home providing amenities and services that Trinity has identified as necessary to lead a healthful and spiritually fulfilling lifestyle: a health clinic, a fresh produce vendor, housing for seniors and families, a job-training center, and athletic facilities. Trinity has been developing a plan for a mixed business and residential community in Roseland for over a decade. “It has always been a vision of Trinity United Church of Christ to build a community that reflects the tenants of the gospel and to impact the community…even during the time that Dr. [Jeremiah A.] Wright was involved,” said Patricia Eggleston, executive director of the Trinity 95th and Cottage Grove Planned Community Development, LLC—Trinity United Church of Christ’s developmental offshoot. Eggleston served as an attorney for Trinity until 2012, when the church created the LLC to oversee the project. Six years later, Trinity is preparing to see the first phase of its vision materialize. Once construction of the health center is finished, which Eggleston anticipated would be sometime between May or June, the Advocate Medical Group (AMG) health center will move into an 11,000-square-foot portion of the space. According to its website, AMG “provides primary care, specialty care, imaging, outpatient services and community-based medical practices” throughout Chicago. The facility should officially open to patients by the end of the year, and depending on its success, could expand to the total 22,000 square feet as Advocate sees fit. The new AMG center, along with other components of Imani, is being built with the aim of addressing many of the resources currently lacking in the area of Roseland where Imani Village will be located. As part of the plan, the AMG facility will be providing health services in a region where preexisting health providers are in jeopardy. Three miles away, for example, the cash-strapped Roseland Community Hospital recently had to lay off thirty-five employees. The future of Roseland Community Hospital, and many other safety-net hospitals that in large part serve Medicaid patients on the South Side, hinges on the Illinois state government’s decision to save or scrap its current Hospital Assessment program. The program, which allows hospitals to receive federal Medicaid funds in exchange for hefty payments to the state, expires at the end of June, and safety-net hospitals are expecting severe budgetary shortfalls if the law is altered from its current form. It’s unclear how Imani Village’s AMG facility would be affected by a rollback in the program. Advocate Health Care (AHC), the company under which AMG operates, did not respond to the Weekly’s request for a formal interview. But partnership between Trinity United Church of Christ and AHC is not unprecedented. Advocate Trinity Hospital, about two and a half miles from the Imani site, is one such collaboration. Both are Lutheran-faith–based organizations and affiliates with the United Church of Christ. The idea of the social determinacy of health informs the other phases of the Imani Village project: it will be a senior lifestyle and family housing complex; a career training center that will work with previously incarcerated individuals; a food hub featuring a five-acre indoor garden and a year-round farmer’s market among other things; a sports facility; a center for the cultivation of entrepreneurship; and more. Trinity’s development arm is still trying to work out what functions will be housed in the Imani Village center and what organizations it’ll partner with to provide these various services when Imani Village opens to the public. Eggleston hopes that the next component of Imani Village to open will be its housing. Brinshore Development is collaborating with Trinity’s LLC to create senior lifestyle and family housing complexes, which together will offer 120 units of housing. Brinshore has experience when it comes to green building, which was one reason why Trinity’s LLC and the development company originally found each other. Ecological justice is a key part of Imani Village’s mission, and one of Trinity’s ministries as well. Since 2014, the church itself has spent $5.2 million on energy reduction measures to become more environmentally sustainable, which it’s done by switching to LED lights, installing a green roof, and building a garden. That mentality extends into the making of the Imani campus, which will be a Leadership in Energy and Environmental Design (LEED)-certified “green” building, according to Eggleston. “Green is the new economy, and we want Imani Village to be a reflection of the green economy,” she said. Much of Imani is geared towards advancing the green economy and preparing individuals to succeed within it. The Nature Conservancy, an environmentally conscious organization located in Arlington, Virginia, has agreed to come aboard to help create a green jobs training program at the center. This program will eventually be housed in a career workforce development center, which will have the dual aim of offering training programs for green careers and training for careers in Imani Village itself. The food hub, too, will bolster Imani’s aim to generate jobs. A future commercial kitchen will serve as a space to support developing food entrepreneurs. The food hub will also include a year-round indoor farmers market; five acres of indoor cultivable land; and a fresh food restaurant and café. Trinity’s LLC is interested in fashioning Imani into something of a fresh food nexus for the Southeast Side. Eggleston said that the LLC has talked to potential co-developers interested in getting involved with these various projects but wasn’t ready to share who those co-developers are. 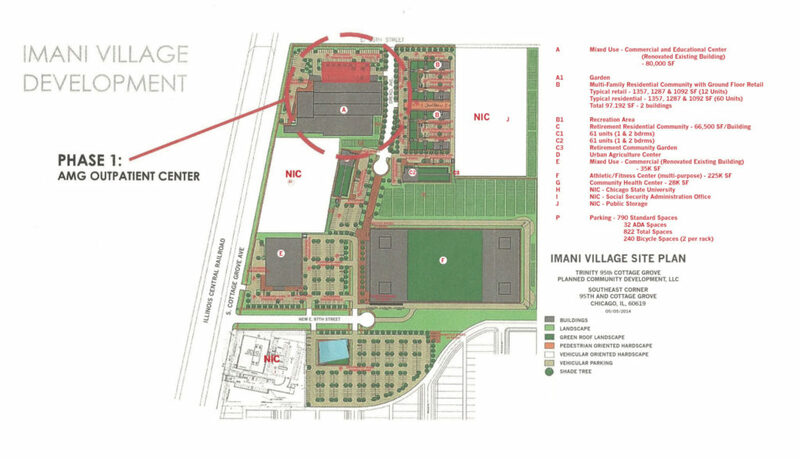 Other components of Imani Village, like the athletic and fitness center, are farther out. The fitness center is set to open in the space that is currently slated to hold their career workforce development center or possibly a charter school. But none of this is “an overnight process,” Eggleston says. She and the other board members expect the entirety of Imani Village to remain unfinished for five years, and even that, she says, is “ambitious.” But considering that it’s taken six years for the project to reach this point, the imminent opening of Advocate’s new medical facility—the first of Imani Village’s resources to become serviceable to the community—is momentous.